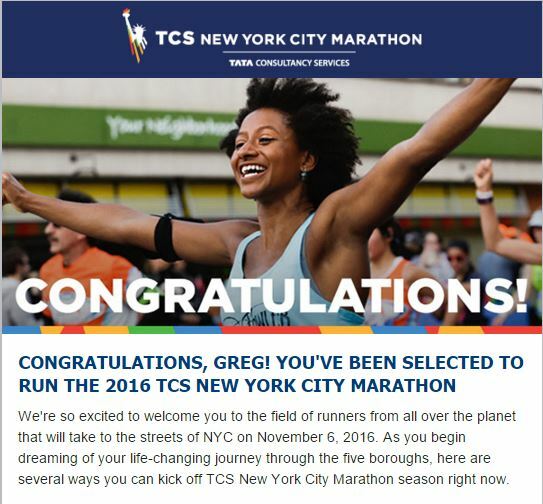 I’m In for the 2016 TCS NYC Marathon! What a day Tuesday was! As I sit here and write about it, I still can’t believe it’s real. 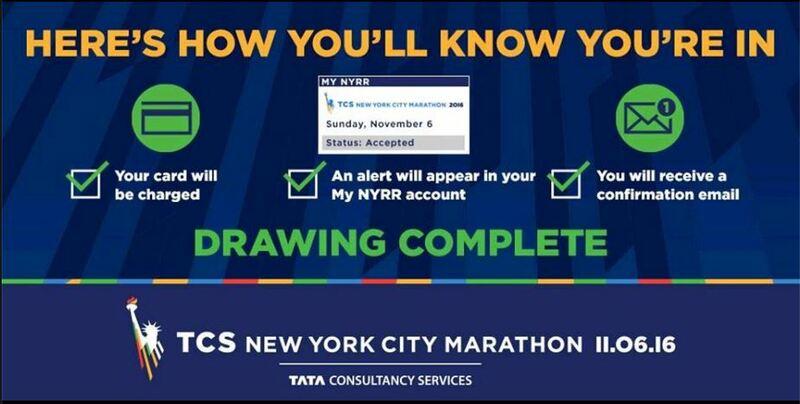 Tuesday, March 8th was the day where the 2016 TCS NYC Marathon lottery was held. On Tuesday, all of us who entered the non-guaranteed entry lottery would find out if we got in. So, here’s the infographic on how you get notified. When I arrived at work, I saw on my Instagram feed that one of the runners I follow had made it. Since I didn’t see any emails from the New York Road Runners Club, I thought I didn’t get in. I mean, someone was already celebrating and I had not emails. Then, I read Juliana’s comment on my post from Monday and learned that the emails come out much later. So, I rushed into my desk and quickly logged onto my bank account. The very first item was a pending charge from the NYRR for $255! Juliana had said she saw her charge at around 8am last year. Mine had to have come around the same time this year! I was excited, but didn’t know if they charged everyone’s account and then reversed the charge for those that didn’t get in. So, I got on Facebook and looked for answers. I saw the above graphic. However, my card charge was listed as “pending.” Did that mean anything? I saw that my friend Kim got in. So, I asked her about it. She informed me that the “pending” charge meant that I was in! Juliana chimed in as well! It was looking good. By lunch time, I saw that a few other running friends of mine had not seen a charge to their credit cards yet. Good news for me, bad news for them. After lunch, I logged onto my NYRR page and saw this!!!!!! I was in!!!!! This was the second check mark! I was in the New York City Marathon THIS year!!!! My reaction to seeing this must have been a little loud. The workers in the cubes next to mine stood up and congratulated me. They cold tell my reaction must have been Marathon news. Yes, the odds were definitely not in my favor. So, I’m humbled to have my spot. There’s a lot of work to do between now and November 6th. With this race now on my calendar, it really sets up my training up through the middle of November. 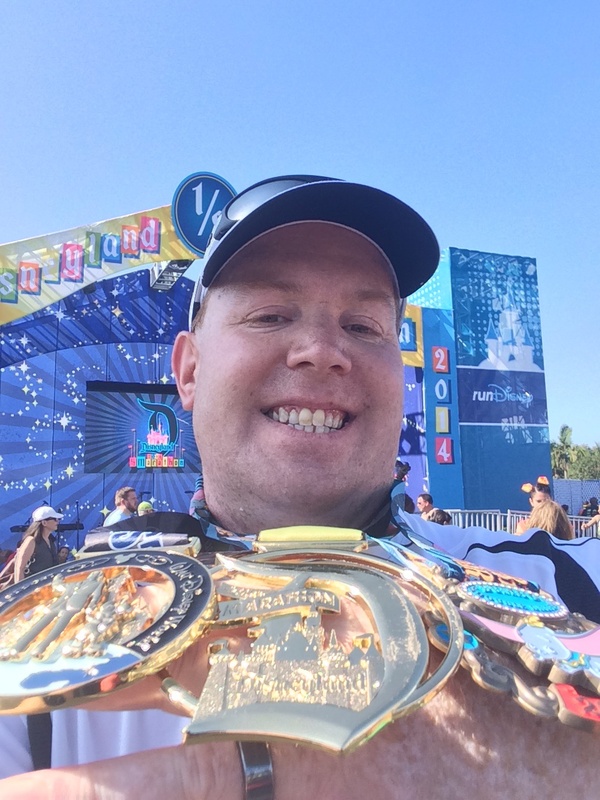 The last time I was this excited about a race was when I finally got in for the 2014 Dumbo Double Dare. 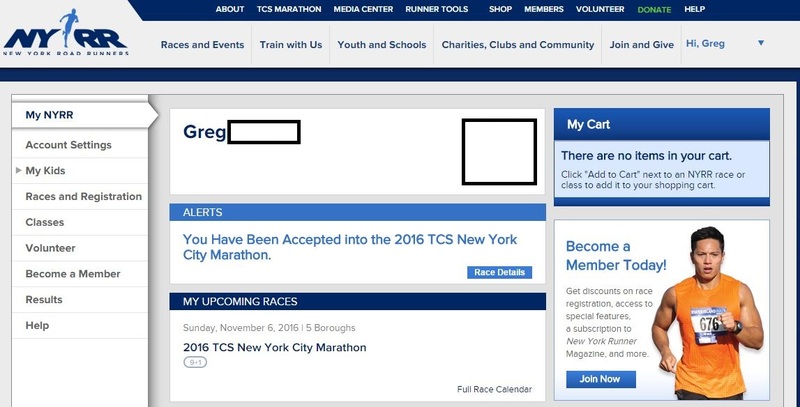 Did anyone else get in for the 2016 TCS NYC Marathon? Again, congrats!! You had a beginner’s luck as well and I am glad I was able to help you out! and dont worry about being emotional, I got the notification on my phone I had been charged (gotta love Apple Pay!) and started crying ON THE TRAIN IN PUBLIC haha. I didn’t care-I was going to run NYCM! Thanks for all the luck you sent my way! It looks like it worked! I can’t wait to run in NYC this November! Congrats!! I can’t wait to hear about the whole experience! Thanks! I can’t wait to write about everything! November 6th is going to be LEGENDARY! Thanks! Sorry to hear that you didn’t get in. There is always next year. Or, you could check in with the possibility of running for a charity.